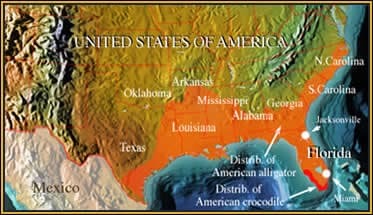 Location: American alligators are distributed throughout SE USA but the American crocodile in the US is confined to southern Florida. 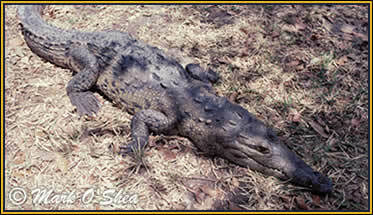 For most tourists Florida means alligators and with four million alligators in the state they are not difficult to find. However, Florida is also home to two other crocodilians, the introduced Spectacled caiman, Caiman crocodilus from Latin America, and the endangered, ocean-going American crocodile, Crocodylus acutus. Almost pushed to extinction by man, the crocodile has benefitted from a recovery program and its numbers are now increasing significantly in south Florida. Mark O’Shea joins Joe Wasilewski at night on his airboat at Turkey Point Power Station where the power station’s cooling channels have become home to a large crocodile population. Mark also visits the remote Taylor’s River location in the southern Everglades, a river which can only be reached from the sea, with famous herpetologist and crocodile expert Dr Frank Mazzotti. Frank takes Mark to the threatened crocodile nesting sites he knows and the two search for crocodiles by torch-light in the lakes along the Taylor’s River. A close view of an American crocodile (Crocodylus acutus), note the narrow snout in contrast to broad snout of an alligator.